I say this a lot and will say it once again: if you truly want to elevate your WordPress business, then it needs to have the right processes and procedures to support it. One of those processes that many consultants don’t think about? Logins to things like WordPress, the control panel and so on. When we talk about missing content, we’re referring to these types of elements that can only come from the client. Without which, you’ll eventually get to a point where you have to halt work and wait for the missing pieces to come through. Now, the last thing you want to do is add “Babysitter” to the list of job titles you hold. Sadly, that’s what many consultants believe they have to do if they’re ever going to get projects done on time, to spec and under budget. But should you have to beg clients for content? No, absolutely not. The key to avoiding these kinds of issues and headaches is to get all essentials from your client before beginning any work. Want to know how to do this without having to postpone project launch dates for weeks or even months at a time? This guide will teach you how to efficiently and successfully collect content from clients going forward. As anyone who’s ever had a project put on hold will tell you, missing content can cause serious problems for your business. Within just a single project, late or missing content can result in a number of issues. For instance, let’s say your client finally delivers content after designs and functionality have already been scoped out. However, you discover that the content doesn’t align with what you had discussed with the client originally. As a result, you end up having to tackle unanticipated (and unbudgeted) work to reconfigure the design accordingly. There’s also the fact that missing content (at any stage of a project) can cause problems for other websites you’re working on. As you stress over late material from one client and waste time emailing and calling them to track it down, the rest of your work suffers as you’re unfocused and your availability goes out the window. But that’s why you have processes in place for your business, right? They are there to account for common roadblocks that try to get in your way. No matter how badly your clients (unintentionally) try to hamper progress, you have already anticipated their moves and figured a way to get around them. Collect all content from the client before the project begins. Offer a content creation service whereby you write all content on their behalf. Anything else proposed by your client needs to be turned down. Realistically, you could start sketching out designs and building a website on a staging server. Dummy content could easily fill those gaps until content is ready. Why hold everything up just because your client has become unresponsive or continues to make excuses for the delayed content? This is when you become the Babysitter. You: Who did you purchase hosting from? Client: I don’t know what that is. You: You know, the company that hosts your website. GoDaddy. Bluehost. Flywheel. Client: I thought you said we were building the website in WordPress? You need to be prepared for the questions and the dragging of the feet and all the excuses that come with placing the onus on your clients to be accountable for their website’s success. To do this, you’ll have to start collecting content before ever hitting the “Start” button on a project. Now that we’ve sufficiently discussed the pains of entrusting content to clients, let’s talk about what you can do to handle it more effectively. You’ll find that by adjusting a number of your processes, you can avoid these content-induced headaches with clients in the future. You can lay the foundation with clients before they even sign the contract and agree to become your client. The earlier you can prime them to understand your process and how it works, the smoother your project will go. This will also help you weed out the kinds of clients that don’t fit well with your business model, so you can focus on serving those who appreciate the true value of your services. As you tackle upcoming pitches and proposals with prospective clients, I’d advise you to set the proper expectations right away. If you expect clients to provide all content, then make it clear that this part of your process is non-negotiable. You might get some hemming and hawing and hear pushback like, “Well, we don’t have it done just yet, but can get it to you very soon”. The client only has to get involved in the project when it’s necessary. Translation: The client won’t have to deal with “annoying” emails and calls about late content. Instead, they can focus on running their business while we handle everything else. The website is designed correctly and adapted specifically to the content from the get-go. Translation: Fewer reworks = lower costs for the client. The website can be completed by the promised deadline. Translation: When the client is accountable to the project, we can hit all our milestones, too. If you find that your prospects are reluctant to agree to these terms—even just at the prospect stage—you have a couple more options available. The first is to tell them about your content creation services. This, of course, doesn’t relinquish them of responsibilities like providing you with logins, logos, style guides or anything they have in-house that you need. However, the content creation piece can now be managed by you as an upgraded service. The second option is to let them go. If the prospect is pushing back on processes you’ve developed to benefit everyone involved, then imagine what it would be like to work with them as a full-fledged client. Just say “no”, in this case. Let’s say you’re ready to sign a client who is well-informed of your intentions to collect content prior to the project start. Is their verbal agreement during initial pitch discussions enough? No, of course not. The next part of your process that then needs to account for this is your freelancer contract. This is the perfect place to add verbiage surrounding the content collection requirement. Or, if you’re providing that service to clients, to define the exact terms of your contribution. Platforms for which you require logins. Brand guidelines and materials (e.g. logos) that the client already has. File formats you need all files submitted in. Specific pages for which content is needed. The number of revisions allowed to content (if any). Due date(s) for all content, information, files and logins. Outline the penalty for the client missing delivery milestones. Additional costs incurred as a result of unexpected content received after the project start. Projected completion date if all content is received on time and no alterations are made to the process. If you will be creating content for the client, some of the items won’t need to appear in the contract. Or they should be amended to put the responsibility on you. Make adjustments accordingly. No matter how many times you reiterate the fact that you collect content before work begins, some clients are bound to ask for a little leeway anyway. Pages for which content is needed. Logins to: WordPress, hosting, control panel, FTP, domain, email, social media, Google Analytics, etc. Original web design files for the website (for rebranding jobs). Acceptable logo sizes: 160 x 160 px (square) or 250 x 150, 350 x 75 or 400 x 100 px (rectangle). Favicon logo sizes: 16 x 16, 32 x 32 or 48 x 48 px. About Us page content with team bios and high-resolution photos (~400-600 words). Service #1 page content (~600-800 words). Service #2 page content with illustrations from old site (~600-800 words). Contact page contact form notes and required fields. Other content (please indicate which page). Once you have your list of content requirements created, save a copy of it in your project management software. This template will serve as the centrepiece of your content collection efforts in the future. The more you can get from your client before the job starts, the less back-and-forth you’ll have to deal with as you’re hip-deep in the project. Luckily, this checklist is just the start of simplifying this exchange. There are tools you will be able to use to collect content much more securely and quickly than if you tried to do it on your own. Not all complaints your clients have about sharing content will revolve around them not understanding the request or not having the content ready. Take the exchange of passwords, for instance. Even if you use a secure project management platform to communicate with clients, they might not feel confident sending passwords over the server. In that case, introduce them to a secure password management tool and let that handle it for them. LastPass and 1password are the current leaders in this space. Not only are they great tools for saving super-strong passwords for your own devices, but they’re great at securely transmitting passwords from one person to another. Log into your account. Open “My Vault”. 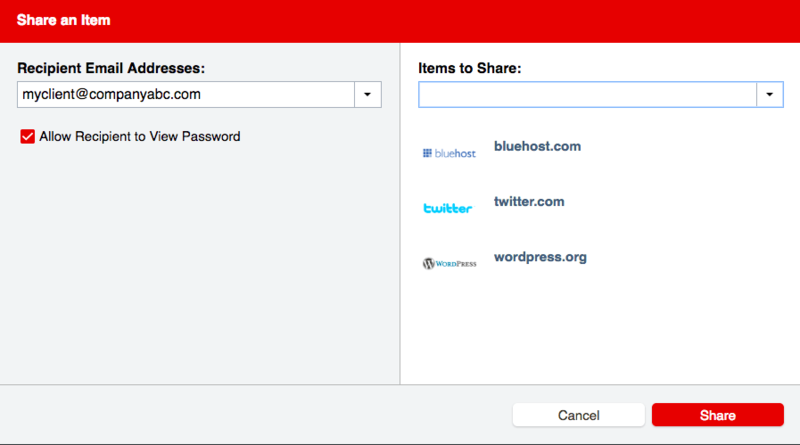 Go to the Sharing Center on the left sidebar. Enter the client’s email address in the field on the left. 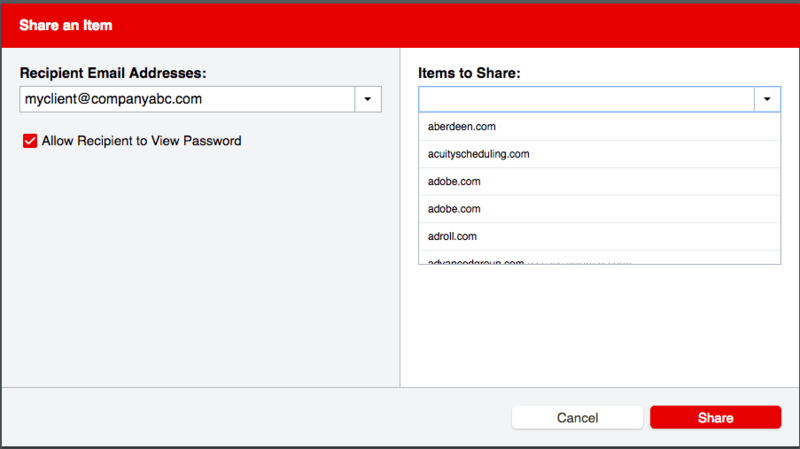 On the right, type in and locate the name of the websites you want to share credentials for. Once you’ve located all relevant credentials, click the Share button. 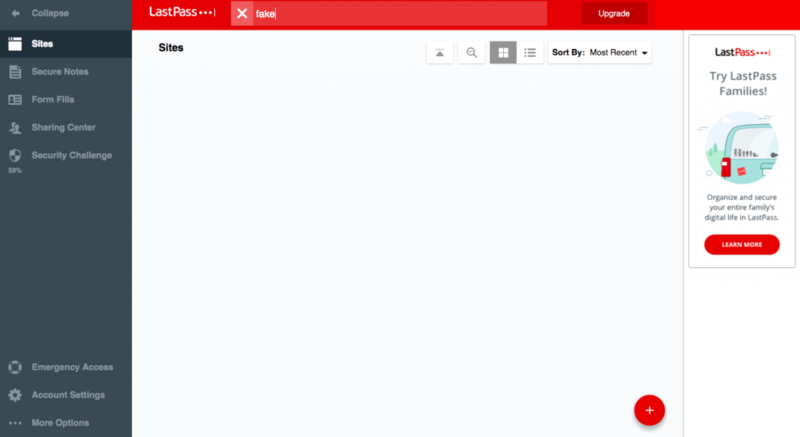 Click on it and instantly retrieve all logins you need to get started. And that’s it! Your clients won’t have to stress over someone intercepting their email to you and you won’t have to deal with transcribing usernames and passwords by hand as they tell them to you over the phone. Whether you’re collecting content from clients, from your own internal team of writers or from outsourced copywriter resources, there should be a central repository where these files are saved. You could, of course, use a platform like Dropbox to store everything. But that still doesn’t address the accountability piece, not to mention the fact that you never know what clients might upload there. You could ask for all available versions of their logo and receive a Word document with each of them pasted in. Hopefully, your checklist will help you avoid many of these problems, but you’re likely going to need more help than that. List out every item you need from the client. Think of this like an informal sitemap. Define the specifics: Do you need text? Do you need images? What files do you need them delivered in? Do you have any length or size requirements? Save and create page or information templates that you are likely to reuse. Include image examples or templates to show clients what you’re looking for. Set a due date for each piece of content or file. Create personalised rules for how Content Snare follows up with clients that are late in delivering content. Create a follow-up email template that you can send to clients and bring consistency to your communication. Your client is taken to a singular interface that prompts them for all required materials. This makes it easy for them to get you everything you need on time. It’s then up to you to log in, download the material and get to work! Even if you make the content collection process as easy as possible with tools like LastPass and Content Snare, some of your clients may have a hard time figuring their way around these systems. Again, if you want to efficiently collect content from each client, you have to anticipate roadblocks such as these and come prepared. While you might not know where these problems will arise, you can certainly tackle them head-on when they do and effectively avoid them in the future. Recording short videos that walk clients through simple tasks and then saving them for future projects would be a huge boon to your productivity. It’ll also bolster the trust clients have in you as you’re prepared to handle their every question. Loom is a great tool for recording short video communications for clients. You can use this either to record a specific use case for one client or you can use this to create templated explainer videos that you’ll provide to every client going forward. And it’s really easy to get started. Simply install with one click and your browser will be instantly equipped with a screen recording tool. Just remember to save the videos you record under the relevant items in Content Snare. That way, you’ve already provided answers to the questions you know your clients are bound to ask. Your project management tool is the key to keeping all of these moving pieces straight and gathering finalised versions and information in one place. 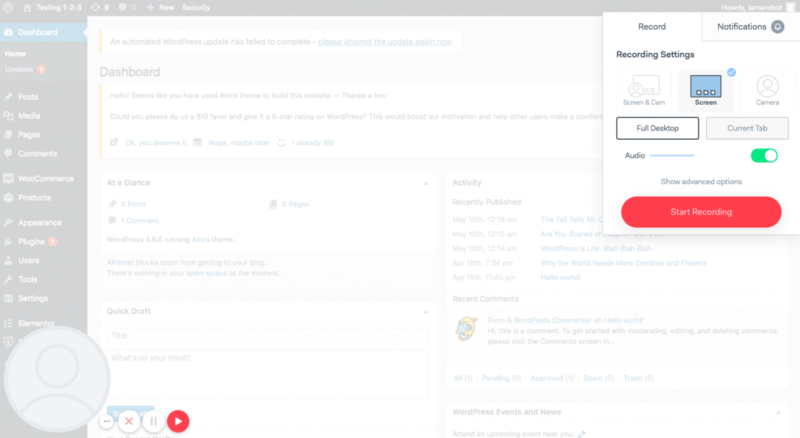 As Simon demonstrated in this WP Elevation tutorial, Asana is a great tool for developing project templates for your WordPress projects. With Asana, you can save the checklist templates you created for your content collation process. Then, duplicate the template for all future projects and save it in the new client’s folder, along with all the content you collect throughout the process. Even if you’re perfectly clear about collecting content upfront, there’s still a bit of work you have to do in the meantime to get a client on board with the process. Once you’ve solidified it with the right tools and templates, it gets much easier. That said, if you’d like to take advantage of a new opportunity to grow your revenue, consider adding content creation care plans to your services. In doing so, you’ll reduce the amount of responsibility that falls on your client shoulders (which will be well-received by them) while opening up a new revenue stream for your business. It’s a win-win. Now, all you have to do is decide if you want to handle the content creation or hire someone to do it. Pay someone who writes for a living to handle this for you. They’ll get it done much more quickly and with better results than you ever would. Set due dates for each piece of content. 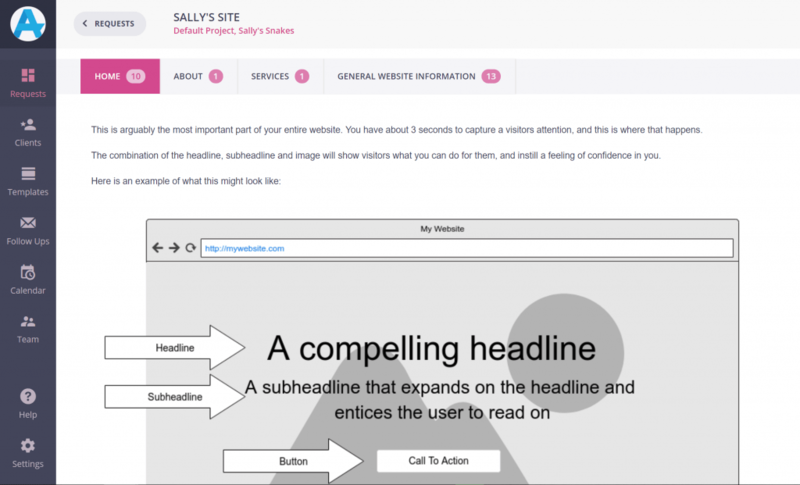 Provide them with wireframes for each page so they understand the context they’re writing within. Invite them to use Content Snare to submit all completed pages. Since you have a hand in developing the content, you won’t have to wait for it all to be submitted before beginning any work (unless you want to). Just keep in mind that the content received from an outside source will have to undergo additional QA steps that content from clients wouldn’t. Your team will first review the content. Then, when approved, it will go to the client for sign-off. So, be sure to schedule your development timeline accordingly around this. Bottom line: Website content has to come from somewhere and unless you have a particular aptitude for writing copy for the web, you need to find someone to provide it. The most likely of places to collect content from is your client. They know their business best and might already have a good portion of it written. However, relying on a client to provide you with all the necessary content, files and logins can put a serious strain on your workflow if you don’t plan for all possible roadblocks. That’s why you create a process that revolves around collecting content first thing. And, if a client is unable to commit to that and would rather have you handle it, you already have an alternate solution available with WordPress content creation care plans! Just remember to focus on the big goals here. Your clients want to get a kickass website from you. You want to help them achieve their business objectives. To do this right and to do this on time, you need to build a fail-proof process that ensures it all happens according to plan.